The Awakening of Faith in the Mahayana (or ‘Awakening of Mahayana Faith’, 大乘起信論) is a text of the Mahayana branch of Buddhism. While the text is attributed by the faithful to Ashvaghosha, no Sanskrit version of the text is available. Instead, the earliest known versions are written in Chinese. Many scholars (including Mochizuki Shinkō 望月信亨) doubt whether the text originated in India, suspecting instead that it is of East Asian origin. Paramartha (499-569 translated or authored the first known version, which dates to 553. Śikṣānanda translated or re-edited another version, perhaps during 695-700. Written from the perspective of essence and function (tiyong) 體用, this text sought to harmonize the two soteriological philosophies of the tathāgatagarbha (or Buddha nature) and ālayavijñāna (or yogacara) into a synthetic vision based on the One Mind in Two Aspects. 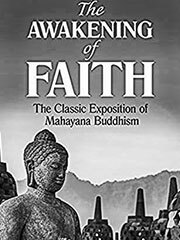 Although often omitted from lists of canonical Buddhist texts, the Awakening of Faith strongly influenced subsequent Mahayana doctrine. It was studied and commented on repeatedly by many East Asian scholars, including Weonhyo 元曉, Fazang 法藏 and Zongmi 宗密. In great part due to the commentaries by Weonhyo, the Awakening of Faith ended up having an unusually powerful influence in Korea, where it may be the most oft-cited text in the entire tradition. It also provided much of the doctrinal basis for the original enlightenment thought found in the Sutra of Perfect Enlightenment. Hakeda, Yoshito S., trans. Awakening of Faith Attributed to Aśvaghoṣa, Columbia University Press, 1967. Richard, Timothy, The Awakening of Faith in the Mahāyāna Doctrine—the New Buddhism, 1907. Vorenkamp, Dirck, trans. An English Translation of Fa-Tsang’s Commentary on the Awakening of Faith, The Edwin Mellen Press, 2004. Buddha Nature, Sallie B. King, 1991, State University of New York Press; see p22 for remarks to the effect that, although Paramartha undoubtedly was among the most prolific translators of Sanskrit texts into Chinese, he may have originated, not translated, the Buddha Nature Treatise as well as the Awakening of Faith. On these points, King cites Philosophy of Mind in Sixth-Century China: Paramartha’s ‘Evolution of Consciousness’ , Diana Y. Paul, 1984, Stanford University Press.